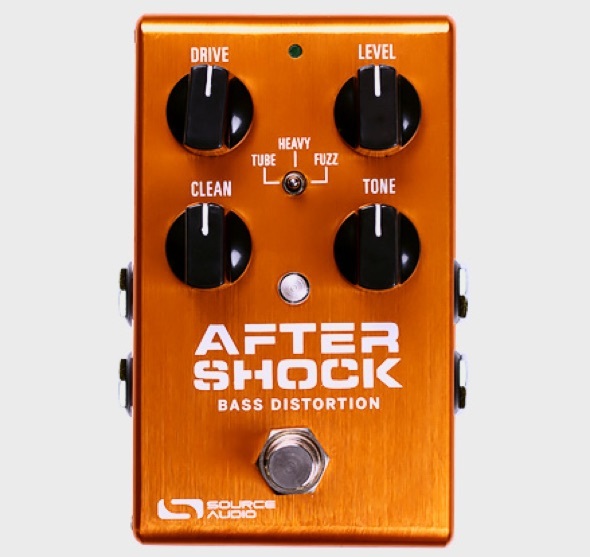 Get down and dirty with the AfterShock Bass Distortion. The AfterShock packs three bass distortion circuits that span the gamut of low-end crunch, from smooth and natural overdrive to full-on fuzz attack. The Tube circuit belts out a subtle, but powerful vintage tube overdrive with a nice smooth breakup and plenty of punch. Heavy offers intense germanium fuzz tones with loads of bottom and mucho grit. Fuzz slams your tone with zipper-like gated fuzz, perfect for those modern, borderline synth lines. The Aftershock’s simple, yet powerful control panel provides the power to sculpt the perfect bass tone. The Clean knob lets you to mix in just enough clean signal to maintain a rock-solid low-end without compromising the pedal’s SONIC GROWL. Adjust the onboard Tone control and find that thunderous sweet spot for any bass/amp combination. Out of the box, the AfterShock offers tremendous tonal range, but dig a little deeper and discover its hidden powerful and flexibility. Every pedal in the One Series line is compatible with the Neuro Mobile App. (a free download for iOS or Android). Link the AfterShock to the Neuro App and access its extended equalization capabilities as well as Source Audio’s library of bonus bass overdrive, fuzz, and distortion algorithms — each algorithm can be downloaded directly to the pedal. Plus, every One Series pedal is fully MIDI compatible when coupled with the Nuero Hub (formerly Soundblox Hub), giving you the power to save up to 128 different presets. 13 Distinct Bass Fuzz Circuits. 2Stereo Input and Output Jacks — Distort upstream stereo signals or split a mono signal to dual outputs. 3Dual Processing — Dual processors and stereo Inputs and Outputs make it possible (via the Neuro App) to split one signal and apply a different drive circuit to each output, blend two drive circuits, or cascade drives to one or both outputs. 4Universal Bypass — Select either analog buffered or relay based True Bypass. 5Expression Control — Compatible with Source Audio expression pedals and the Hot Hand 3 Universal Wireless Effects Controller. Connect the AfterShock Bass Distortion to the Nuero Mobile App (a free download for iOS or Android) and explore the power of effect downloading, customization, and sharing that comes with every Ones Series pedal. 1Free Effects Downloads — Every Source Audio bass overdrive, fuzz, and distortion algorithm is available as a free download directly to your AfterShock. 2Customize Effects — Access Neuro’s extensive equalization capabilities or experiment with multiple drive circuit blends or stereo splits. 3Advanced Signal Routing — Choose from a range of signal routing possibilities like effects send, multi signal mixing, or mono signal splitting. 4Save and Share Customized Presets — Once you’ve fine-tuned an effect, save it to your personal effects collection and share it with the growing community of Neuro users. 5Download Presets — Explore Source Audio’s ever-expanding library of effect presets. 6Simple Connection — The Neuro App. connects with the AfterShock via the mobile device’s headphone jack and Stereo Input 2 on the pedal. A Neuro App connector cable (1/8” to 1/4”) is included with the pedal. The AfterShock Bass Distortion also features full MIDI capability and simplicity when coupled with the Neuro Hub (formerly Soundblox Hub). 1Preset Saving — Save up to 128 effect presets. 3External Expression Control — Connect the Neuro Hub to any Source Audio expression pedal, Hot Hand 3 Wireless Effects Controller or third party TRS (Tip Hot) expression pedal for on-the-fly control of any adjustable parameter.